The Morgan Tsvangirai-led MDC-T party on Thursday wrote to the speaker of the National Assembly Jacob Mudenda and Senate president Edna Madzongwe seeking to recall 18 MPs. MDC-T lost a number of legislators who crossed the floor to the MDC renewal team after a nasty fallout between Tsvangirai and his then secretary-general Tendai Biti. This is the second time Tsvangirai has approached parliament in a bid to sack the legislators, but then Mudenda advised MDC-T to approach the courts to resolve their dispute over the party ownership. Both formations claim to be the original MDC. Addressing journalists in the capital yesterday, the newly elected spokesperson, Obert Gutu, said during the recent congress, the MDC-T resolved that the legislators who crossed the floor ceased to be members of the party. "The MDC-T held a successful congress recently and very important resolutions were upheld, but the most significant resolution is the one regarding the recalling of MPswho were elected on the MDC-T ticket to be members of the 8th Parliament of Zimbabwe in both houses," Gutu said. "Our secretary-general, Douglas Mwonzora, wrote a letter which has since been hand delivered this afternoon. It is now in the office of the Honorable speaker of Parliament Jacob Mudenda, as well as the office of the president of the Senate Edna Madzongwe. The letter was written in respect of Section 129(K) of the Constitution of Zimbabwe. What (we) are doing as a party is simply and merely to inform that the former party members have been recalled. There are no other obligations we have to do as a party, all we have to do is to invoke the provisions of 129(k) (sic)." Some of the MPs under fire are Tendai Biti (Harare East), Willas Madzimure (Kambuzuma), Lucia Matibenga (Kuwadzana), Evelyn Masaiti (Women's Quota), Paul Madzore (Glen View South) Reggie Moyo (Luveve), Solomon Madzore (Dzivarasekwa), Bekithemba Nyathi (Mpopoma),Moses Manyengavana (Highfield West), Alert Mhlanga (Pumula), Sipepa Nkomo (Lobengula), Settlement Chikwinya (Mbizo), Judith Muzhavazhe (Proportional Represantation), and Gorden Moyo (Makokoba) while Senators are Sekai Holland (Chizhanje), Rorana Muchihwa (Chikomo) and Watchy Sibanda (Matebeleland South). 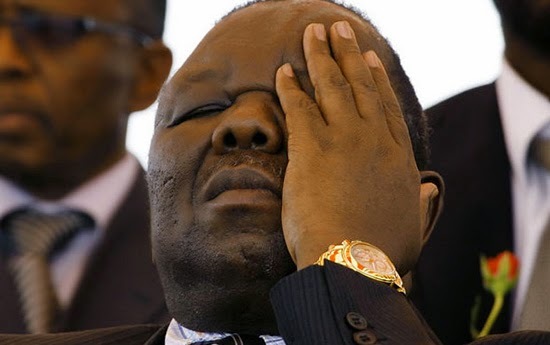 The legislators dumped Tsvangirai, accusing him of being a dictator and being undemocratic. In a letter dated November 5, addressed to both Mudenda and Madzongwe, Mwonzora said that the 18 MPs have ceased to be members of the MDC-T party. "We advise that the Movement for Democratic Change (T) held its 4th congress in Harare on the 31st of October and 1st November 2014. At that congress it was resolved that the members of Parliament whose names are listed in the attachment hereto and who were elected to parliament under the MDC ticket have ceased to belong to the MDC-T," Mwonzora wrote. "Accordingly, and in terms of Section 129(k) of the Constitution of Zimbabwe, we hereby formally give notice to withdraw these members of Parliament with immediate effect. Please kindly note, Mr Speaker Sir, that the law does not give parliament or the Speaker any discretion once a party has given notice to withdraw its members of parliament."